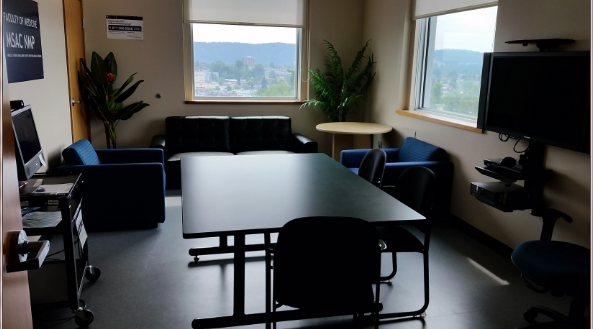 The MSAC NMP is a lounge and video conference room in the University Hospital Northern BC (UHNBC) 5032. The space officially opened as MSAC NMP in April 2017. Currently it is equipped with videoconference equipment, a couch, and lounge chairs. The room is often used to host video conferences of events taking place at MSAC Vanouver. Check the calendar posted outside of the the room to look for upcoming events. If you would like to book MSAC IMP for your event, please submit your request throught the UBC FoM Room Booking Form.